This week the Harry Potter universe gets a little bit bigger with the release of Fantastic Beasts: The Crimes of Grindelwald. While not yet the sprawling epic that the Harry Potter series was, Fantastic Beasts is already pretty deep into the mythology with only two movies. The last film introduced a ton of new characters and plot threads that fans will see continue in the sequel, so it’s understandable if you need a little catching up. The Fantastic Beasts series follows Newt Scamander decades before Harry Potter was ever born and the magizoologist finds himself in the middle of a war between the Wizarding World and the dark wizard Grindelwald. Being the sequel, the movie draws on a lot of elements that were set up in the first film, in addition to some things people may remember from the Harry Potter films. It might not be as easy as casting a spell, but here are all the things you need to know before catching Fantastic Beasts: The Crimes of Grindelwald in theaters. The main protagonist of these films is Newt Scamander, a Hogwarts dropout who has a passion for studying and protecting magical animals. He writes a book (Fantastic Beasts and Where to Find Them) that a young Harry Potter will one day read while at Hogwarts. Newt was working on the book in the first movie, but it’s published by the time the sequel begins. The awkward but good-hearted wizard likes animals more than people, and protects endangered or hurt species in his magical briefcase until he can release them into the wild. They also help get him out of plenty of scrapes, but not even nifflers can help get him off of Grindelwald’s hit list. Fans would do well to remember Tina Goldstein, one of the four main protagonists in the first movie. Tina is an auror of MACUSA, the American wizard community’s version of the UK’s Ministry of Magic. At the beginning of Fantastic Beasts, Tina was dismissed from her position for assaulting a No-maj (non-magical person), but she was reinstated after she aided in the capture of Grindelwald. When The Crimes of Grindelwald picks up, Tina is on a new mission in Paris and hasn’t seen Newt since they parted ways at the end of the last movie. Jacob Kowalski has the distinct honor of being the only non-magical human in the Harry Potter series. Jacob had the simple dream of opening his own bakery before a chance encounter with Newt sent him on a journey through a magical portion of the world he never knew existed. Sadly, Jacob voluntarily had his adventures with Newt erased from his memory to protect the Wizarding World’s secrets, including the existence of Queenie Goldstein, Tina’s sister and his budding romantic interest. Jacob is in Fantastic Beasts 2, but for what reason or how he gets his memory back is unknown until the flick hits theaters! Technically the MacGuffin from the first movie, Credence was an incredibly powerful and dangerous Obscurial, a magical child who represses his or her magical energy into a dark, parasitic force. Credence grew up with an abusive and bigoted adoptive mother who believed in witches and “evil” magic, so Credence subconsciously buried his magical energy for the majority of his life. He eventually snapped, killing a bunch of people before he was cornered by MACUSA. Newt and Tina wanted to help him, but a disguised Grindelwald tried to manipulate him for his own purposes in Fantastic Beasts and Where To Find Them. Ultimately, Credence seemingly perished at the end of the film, but eagle-eyed viewers spotted evidence he might have lived. Fans will find Credence traveling with a circus trying to find his real parents in the sequel. 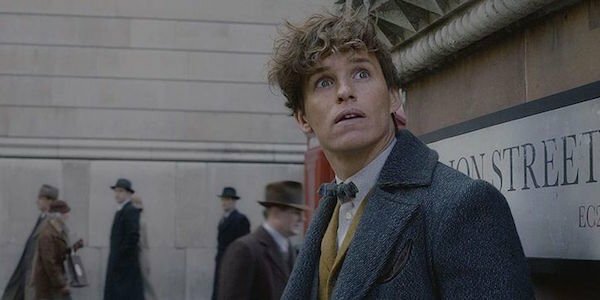 Fantastic Beasts didn’t dive too deeply into Newt’s backstory, but the flick did offer some hints that he had some issues. For one thing, he was expelled from Hogwarts after taking the fall for an experiment done by Leta Lestrange (related to Bellatrix Lestrange) that accidentally harmed another student. Newt was in love with Leta and never really got over her, which must make Thanksgiving at the Scamander house pretty awkward because she’s engaged to his brother, Theseus. The older Scamander sibling is a war hero, having fought in World War I, while Newt is seen as the disappointing black sheep of the family. Both Leta and Theseus have a role to play in Fantastic Beasts 2 and assumably the coming sequels. The big bad of the franchise is Grindelwald, a dark wizard who wants the magical community to rise up out of hiding and over the muggle world by force. He’s sort of like a proto-Voldemort, but he led a deadly campaign with a legion of followers. In the Fantastic Beasts and Where To Find Them, he was masquerading as Percival Graves of MACUSA before his identity was revealed by Newt. Grindelwald was placed into custody and imprisoned, but you just can’t keep a good evil wizard down. It’s no surprise that Grindelwald will be breaking out of prison to resume his war in The Crimes of Grindelwald sequel. One of the big draws of Fantastic Beasts: The Crimes of Grindelwald is the introduction of young Albus Dumbledore. The fan-favorite character is back and he recruits Newt to take down Grindelwald on his behave because he “can’t make a move,” in Dumbledore’s own words. The history between Grindelwald and Dumbledore is complicated. The two of them were very close in their younger years, the two of them bonding over their genius and quest for power. However, this ultimately resulted in the death of Dumbledore’s sister, splitting the two of them up for good. It’s also been strongly suggested that Dumbledore was in love with Grindelwald and the falling out deeply affected him. The two of them will eventually engage in a legendary duel that decides the fate of the war, but Dumbledore seems a long way off from making any moves. Here’s a flashback from the earliest days of Harry Potter. The Mirror of Erised is a magical artifact that allows the used to see their hearts deepest desire. For Harry, this was his parents, and for old Dumbledore, it was “socks.” Young Dumbledore look will be a little more open. He can be seen looking in the mirror in a trailer, seeing the face of his old friend/flame/foe Grindelwald. If you find yourself confused as to why Dumbledore is staring at this mirror in the movie, just remember it’s not the first time we’ve seen it. Newt loves magical creatures, but I’m curious what his thoughts are on boggarts. Boggarts are shape-shifting creatures that take on the appearance of whatever most frightens the person who encounters it. If you are scared of spiders, then it will transform into a giant spider and no one knows what a boggart’s true form looks like. Harry Potter learned how to defend against one at Hogwarts, and we can see a young Newt learning that very same lesson in the trailer. Dumbledore was his professor and we will likely gain more insight into Newt’s character after seeing what he most fears. Just when you were starting to get used to MACUSA as the authority on magical law, here comes the Ministry of Magic again. The Crimes of Grindelwald is capturing a bit more of those Harry Potter feels by returning to familiar things and places like Hogwarts and that includes the Ministry. The Ministry is the government for British wizards and we’ve seen that they have a presence in the movie, courtesy of some trailers. The Ministry is keeping an eye on Dumbledore and Newt, but it’s unclear how strong a presence it will have in the narrative. We’ll likely learn a lot more this weekend, but for now, if you want to know more about Fantastic Beasts: The Crimes of Grindelwald after reading these exciting tidbits, take a look at our full guide. Kim Porter’s Last Family Outing Was Her Son Quincy’s Movie Premiere (PHOTOS) Heart attack: Should you avoid eating eggs if you have high cholesterol?